This is one of a few ways to make Dashi! You can make vegetarian Dashi by using only Kombu (kelp). 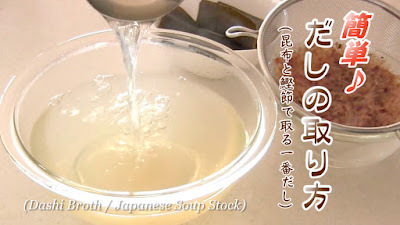 Dashi does not mean fish btw... it means "Soup Stock". Kombu (kelp), Hana-katsuo (large bonito flakes), and/or Niboshi (small dried sardines) can be used to make the broth. The combination is up to you. 1. Cut Kombu in half, then clean it with moistened towel. Soak in 800ml water for 30 minutes. 2. Heat the pot on medium, before it starts to boil, remove the Kombu, add Hana-katsuo, mix, stop the heat and wait until they soak completely. 3. Strain the Dashi soup with a strainer (with a clean cloth or a paper towel if you have). *Do not squeeze the bonito flakes too much since they can add bad smell. For baby food, you can store it in the freezer for a week! You can make homemade Furikake (rice seasoning) with leftover Dashi ingredients!